A local acronym was Look, Duck and Vanish. 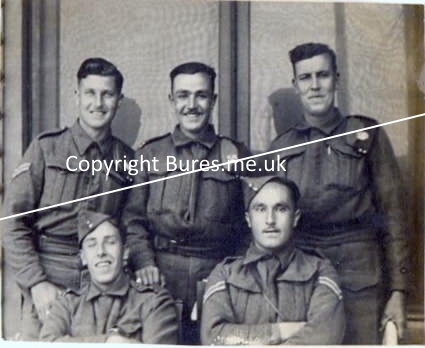 During 1940, the LDV changed name to the HOME GUARD. In Essex alone by mid 1942, some 40,000 men had enrolled. 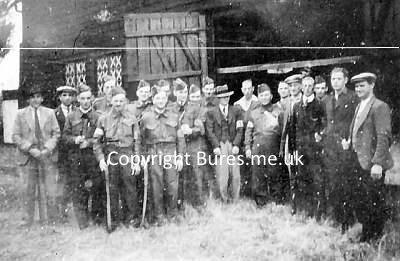 Bures men rallied to the call to form No4 Platoon of "C" company 15th Essex Battalion of the Home Guard. 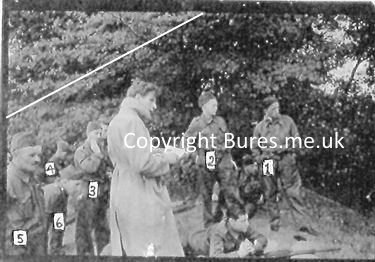 The War Dept decreed that Bures because of its military importance with a river crossing should be defended at all costs. For the LDV or regular soldiers to abandon the village was not an option. 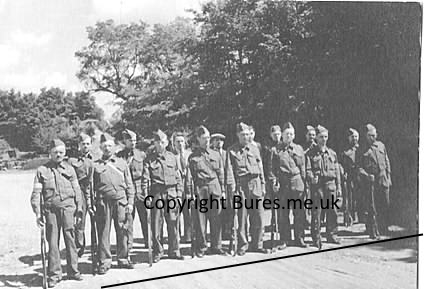 The Home Guards main objective was to protect the Stour Bridge and support the regular soldiers billeted in the village. The unit trained in Chambers yard and drilled on the recreation ground. These were men with reserved occupations, such as farmers, firemen, doctors etc. R F 'Conrad' Goldsmith, Pte. Gordon Drake owned a butchers shop in Bures, as well as a slaughterhouse. A number of the patrol were employees of the slaughterhouse. 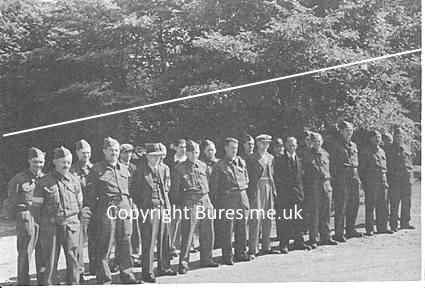 Gordon Drake was treated at St Leonards Hospital in Sudbury for his injuries when a stray antiaircraft shell hit the slaughterhouse on October 19th 1942. One man, Reginald Drury was killed and another two, including Walter Smith, admitted to hospital. The shell was reported to have come from Colchester. Pat Baker was an assistant slaughterman at the slaughterhouse. Pat Baker was a keen cricketer and Honorary Secretary of the Bures club for many years. 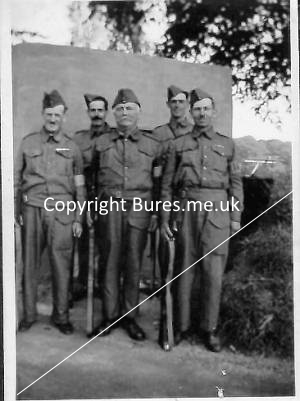 Drake, Baker, Smith and Chambers all appear in the villages regular Home Guard records in late 1940, before they joined Aux Units. 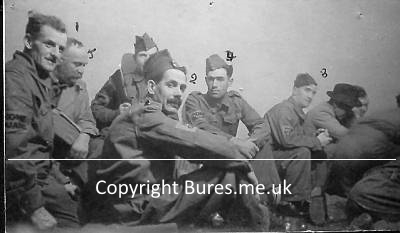 David Chambers was one of the local Chambers brothers, David left the Home Guard and joined the RAF in September 1941, reaching the rank of Warrant Officer flying Hurricanes. Fred Smith joined the RAF in August 1941. Normally the patrol met in Gordon Drakes house. The patrol went to River House at nearby Earls Colne for training. Gordon Drake mentioned going to Wiltshire, so he almost certainly went to Coleshill House. Seems to have been promoted above Pat Baker who was a sergeant. Their Commanding Officer was Dr Thomas Wood, an elderly famous but very short sighted musician. 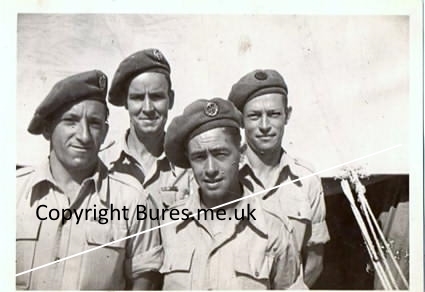 Messrs, Commanding Officer Dr Thomas Wood, Assistant & Acting Adjutant R Probert, G Drake, Quarter Master Baker, Diss, & Alfred Hume. Messrs, Six-Smith, Bird, A Eaves, C Cardy, Symonds, D Chambers, F Hume, P Hume. 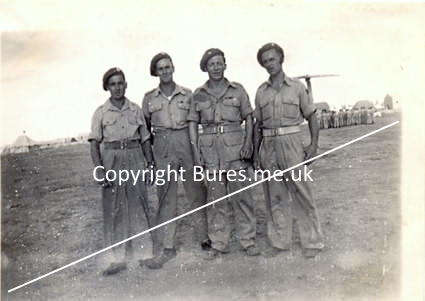 Left to right:- Curly Eaves, C Cardy, Pat Sixsmith. Ralph Symonds and G. Bird. In the event of an emergency or "Red Warning" from HQ, key members of the group would be informed by telephone. However Messrs, Clampin, Keys, Smith W and Healey were not to be disturbed on a Saturday night - I leave this to your imagination. During August 1940, six Browning automatic rifles arrived from the USA. There were no manual or instructions and they were assembled by trial and error, in the post room of the vicarage. To make matters worse they were packed in wooden boxes in thick glutinous grease, just as they were ready to send to France in 1918. You can imagine the mess trying to clean up these parts, cleaning rags soon became impregnated with this treacle like grease. Such was the level of crisis that no documents were issued by the War Office either. However Richard Probert managed to purchase from a local bookshop, a manual on the Browning Automatic Rifle for one shilling. Other bookshop manuals, were freely available on the Colt, Lugar, Mauser etc. During the same month, the group had to collect boxes of `Molotov Cocktails` from Boxford. The inflammable material inside the bottle was liquid phosphorus, somewhat delicate and very dangerous to the handler. They were intended to be thrown at the invading German Tanks. As far as anyone can remember, these were stored in underground drains at Chambers Bus Station yard. There were several incidents during this Aug - Sept period, The most memorable was a `white parachute` reported landing in a nearby field on a moonlit night. On closer inspection, it turned out to be a white cow moving around behind a hedge in St Edmunds Lane. This incident took place at the height of the Battle of Britain, when invasion was though to be imminent, everybody was naturally very nervous. It was a very highly intense and jittery period - although the local residents seemed to be very calm about it at the time. Churchill gave the codeword "Cromwell" for the imminent invasion of the British Isles. Subsequently on 7th September 1940 the codeword was issued and Church bells rang throughout the land. 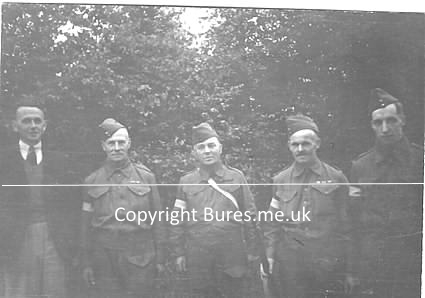 1.5 million Home Guard troops were mobilised in order to defend our country. Fortunately it was a false alarm and the troops stood down. 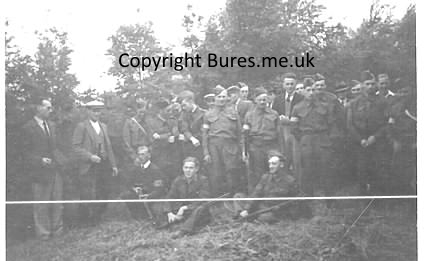 Acton Rifle Range 13th August 1940. Photo taken by Dr Thomas Wood. Commanding Officer was Col. P. Young. 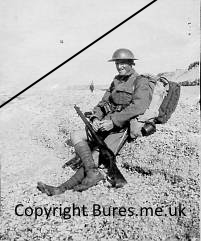 No5 Frank Cansdale (Nicknamed "Corporal"
Text kindly supplied by Col R.H.C Probert. 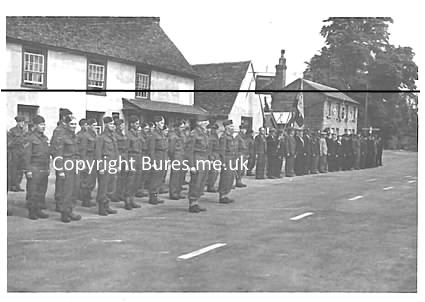 Previously used at the 1995 Bures Exhibition to commemorate 50th anniversary of VE day.